Learn more about the different types and how to keep patients enthused about using them. 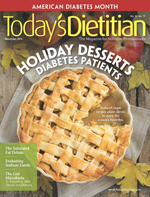 Dietitians often tell clients and patients that controlling blood sugar levels to prevent highs and lows is an important aspect of diabetes self-management and that keeping a food diary, in the form of a physical book or journal, a computer software program, a website or app, or even a digital photo gallery, can play a key role. Today's Dietitian spoke with certified diabetes educators (CDEs) about the benefits of food diaries and the different types clients and patients can use to best fit their lifestyles to facilitate diabetes self-care. It's common knowledge that food diaries can track basic information such as portion sizes and the amount of food people eat. They also can track medication use; physical activity; nutrition information; levels of ketones, blood glucose and insulin; calorie counts; and percentage of recommended daily intake. While all of these values are possible to calculate in a physical book or journal, many computer-supported programs and mobile apps have built-in calculators or memory banks that easily can provide this information. A review of studies done on mobile health (mHealth) applications in diabetes management found that digital food diaries were an effective method of diabetes self-management.1 Specifically, mobile phone apps were found to be more effective than computer-based programs for diabetes self-care. The mHealth apps gave patients the opportunity to take a more active role in their health management.2 "When keeping a food diary to understand the relationship between carbohydrates, exercise, and their blood glucose level, the patient can get results very quickly," says DiabetesCare.net consultant Clara Schneider, MS, RD, RN, CDE, LDN, from Norfolk, Virginia. Amy Aponick, MPH, RD, LD/N, CDE, an outpatient diabetes educator at the University of Florida Health's Diabetes Institute in Gainesville, Florida, agrees that food diaries can be an invaluable part of diabetes self-management. "I use diaries to assess the patient's carbohydrate counting skills and whether or not they're taking correct insulin doses," she says. "A food diary can identify unfavorable patterns in carbohydrate intake and can help clients realize how often they might be splurging on unnecessary calories." According to Megan Day, MS, RD, CDE, a gestational diabetes specialist at Cooper University Health Care in the greater Philadelphia area, "An accurate food diary brings those quick snacks and sneaky calories to light." Although some people with diabetes are resistant to keeping a food diary, dietitians usually can persuade them once they see the benefits. "A basic food diary is a lot to ask for, so sometimes I just ask a patient to take pictures of their meals with a digital camera or smartphone for a few days before their appointment and bring this along with their glucometer," Aponick says. "A picture is worth a thousand words. Pictures of meals can truly help identify if the patient understands carbohydrate counting and if they're dosing their mealtime insulin correctly." Despite the benefits of a food diary and the digital options available, some clients and patients lose the desire to keep one because their health practitioner doesn't review or discuss it. "I've heard from people who have been asked by their health care provider to keep a food diary and/or a blood glucose diary and then the health professional never looks at it," says Carolyn Harrington, RD, CD, CDE, program coordinator at Aspirus Diabetes Education Center in the Wausau, Wisconsin, area. "For the tool to be of value, it needs to be reviewed, discussed, and appropriate recommendations offered by the provider at each visit." Once a client or patient agrees to keep a food diary, it's important for dietitians to know about the different types available. "Everybody has their own preference for recording. Some prefer keeping a notebook, others like apps such as MyFitnessPal or Lose It!, and some prefer a spreadsheet," Day says. For those who prefer to use a computer or mobile device, they can download apps such as GoMeals and DiabetesCare.net, which have a MyCare Diabetes Tracker specifically for people with diabetes. Day recommends MyFitnessPal or Lose It! "They're similar in style and user experience. If you're even the slightest bit tech savvy you can easily navigate either of these apps." Schneider recommends the MyCare Diabetes Tracker. "Unlike other fitness apps, the MyCare Tracker keeps a record of blood glucose, medication, as well as typical diet and exercise," she says. The benefits of using such apps were reported in a 2014 comparative study on the daily usability of FoodLog, a smartphone-based food-recording tool assisted by image retrieval.3 The study found that the FoodLog app with image retrieval was a more effective method of dietary monitoring than the version without image retrieval capabilities. Image retrieval allows users to take a photo of the food they eat in addition to inputting text descriptions. Users can label the food image, and input caloric content and portion size. Each time users take a photo, a visual search is done to locate the food item, and users can adjust portion sizes according to the contents of their current meal. The images are displayed in a calendar view as well as the daily diary, allowing users to review their daily food intake. Another study compared 71 commercially available apps for diabetes self-management that included physical exercise, insulin dosage or medication, blood glucose, and diet.4 While user attitudes improved when using the apps, the perceived limitations included lack of personalized feedback, usability issues, and problems concerning integration with electronic health and medical records. Users were more likely to abandon an app when they encountered technical problems or if the cost of the app itself or annual subscription was too great. Harrington says older patients may find a handwritten food diary much easier to use than handheld devices. "With my population of mostly older people with type 2 diabetes, I find a written weekly food diary form broken down by the day of the week and each meal is most helpful," she says. "When creating a food diary, I use columns for portion sizes, food/beverage, and carb content." "The greatest benefit derived from keeping a detailed daily food diary is in learning how certain foods and meals affect blood glucose levels," Harrington says. Aponick uses food diaries as teaching aids. "I find it helpful to teach patients basic nutrition concepts such as understanding how to group foods into the three main macronutrients or types of calories: carbohydrate, protein, and fat," Aponick says. "I then describe the effects of each of the macronutrients on blood glucose levels. This knowledge helps patients begin to understand the roles that carbs, protein, and fat play in balancing meals, promoting satiety, and improving postprandial blood glucose responses." Patients may prefer a specific method for keeping a diary, such as a handwritten form, a computer spreadsheet, or an app, but it's sometimes best for dietitians to initially hand their clients and patients a diary. "It's extremely helpful to provide the patient with the actual diary so they can start ASAP and have no excuses," Day says. "When patients come back for follow-ups, it's essential that the dietitian takes the time and thoroughly goes through the diary to reinforce what a great job the patient did, and why keeping a food diary is so important. This will help keep the patient on track and give them more incentive to continue this beneficial practice." — Nicola Davies, PhD, is a health psychologist and writer with a special interest in dietetics. • Diabetes Goal Tracker. From the American Association of Diabetes Educators, this free app for iPhone and Android users helps people with diabetes set, track, and achieve behavior change goals. It features educational materials, customizable reminders, a notes function, and an option to share completed goals with others. • Diabetes UK Tracker. This app allows users to track weight, blood pressure, calories, and blood glucose as well as ketones. And it has a calorie counter. Clients can send graphs and notes to a health care professional or share them on Facebook or Twitter. • Glucose Buddy: Diabetes Helper. Rated 4+ by users and developed for iOS, this app supports entries for diet, exercise, blood glucose, and medication. • Enquos. This integrated website and mobile application launches this month and will enable people with diabetes to securely track, analyze, and store fitness, nutrition, and health information, and manage blood glucose. The system offers a photo food journaling feature, more than 6,000 nutritionally analyzed recipes, and over 20 different dietitian designed meal plans for diabetes and other dietary preferences. • Diabetes Buddy Lite: Control Your Blood Sugar. Rated 4 out of 5 by users and developed for iOS, this app tracks weight, diet, exercise, blood glucose, and medication. It includes a food database for easy entry of foods eaten. • Diabetes Pal by Telcare. Rated 4.5 out of 5 by users, this app syncs with the user's glucose meter to help with insulin dosing and monitor trends in blood glucose readings. The app will notify the user if a high glucose level is detected. It also tracks food, weight, blood pressure, exercise, and A1c measures. • DiaLog. This app includes diet, exercise, blood glucose, and medication support with a configurable insulin calculator and a food database with glucose values. The free version is a 30-day demo and the full version costs $6.99. • DiabetesManager by AT&T mHealth Solutions. This app includes support for diet, exercise, blood glucose, medication, and an insulin calculator. It also provides automated real-time feedback and behavioral coaching for users with type 2 diabetes. • Diabetes 360. Rated 4+ out of 5 by users, this app is only available on iOS. It includes a customizable insulin calculator based on glucose levels as well as total carbohydrates and support for medication, blood glucose, exercise, and diet. The free version (Diabetes 360 Lite) is limited to five log entries; the full version costs $4.99. • Lose It!. Rated 4.5 out of 5 by Google, this free app supports weight loss and allows people to join public challenges and community groups while sharing on Facebook and Twitter. If users want a full spectrum of features, such as fitness, diet, blood glucose, and blood pressure monitoring they will need to pay $39.99 per year. • MyCare Diabetes Tracker. This app helps people manage their diabetes through meal building, planning, and analysis. • GoMeals. Rated 4 out of 5 by users, this app includes a food tracker with calorie counts, a food database, and nutritional values. The activities tracker keeps tabs of the number of calories people expend during exercise, while the glucose tracker allows users to input and record glucose readings. • MyFitnessPal. This app was rated 4 out of 5 by users and has an extensive food database. People can record and track measurements such as diet, exercise, and blood glucose while adding their own foods and recipes to a personal food database. 1. Klonoff DC. The current status of mHealth for diabetes: will it be the next big thing? J Diabetes Sci Technol. 2013;7(3):749-758. 2. Årsand E, Frøisland DH, Skrøvseth SO, et al. Mobile health applications to assist patients with diabetes: lessons learned and design implications. J Diabetes Sci Technol. 2012;6(5):1197-1206. 3. Aizawa K, Maeda K, Ogawa M, et al. Comparative study of the routine daily usability of FoodLog: a smartphone-based food recording tool assisted by image retrieval. J Diabetes Sci Technol. 2014;8(2):203-208. 4. El-Gayar O, Timsina P, Nawar N, Eid W. Mobile applications for diabetes self-management: status and potential. J Diabetes Sci Technol. 2013;7(1):247-262.